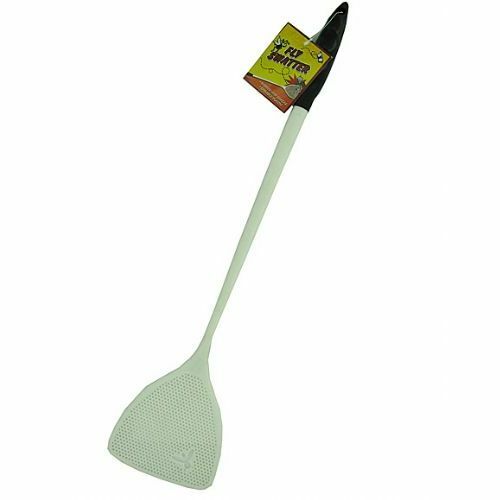 Keep annoying pests away with this Fly Swatter with Grip Handle. No more rolled up magazines or newspapers! This swatter is made with durable white plastic and has a black rubber grip handle and a cut out design of a fly on swatting area. Handle has a hanging hole for easy storage. Measures approximately 21 1/2 long with a swatter area of 4 3/4 x 4 3/4. Comes packaged with a hang tag. 96 Pack of Fly Swatter Gun. 15"